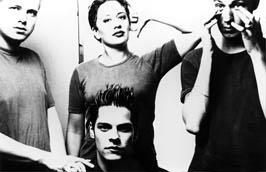 In 1996 Stina Nordenstam directed the video for a Swedish rock band Souls` single "Expensive". The video is 80ties themed. The band was not too happy about the video for their lead single of the long player "Bird Fish or Inbetween". The second single from the album, "Cello (Where You Where)", did however got some MTV play. The band did also toured USA with Bush in 1997, but broke up later that year. - How did you get in touch with Stina? Johan: Let her burn in hell! Cecilia: I do not think it is that f***ing bad. It`s the 80ties. It is not brilliant, but it is a video. It does not tell much. We are on the same label [Telegram Records], it`s probably why. - It is fashionable to use pop directors.